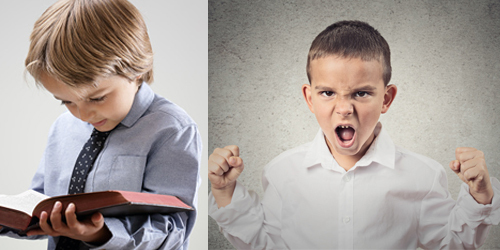 Is Your Church Raising Mean Kids? The research, conducted for the scientific journal Current Biology, surveyed around 1200 children raging in age from 5 – 12 with both religious and non-religious backgrounds. And the findings were undeniable. “The findings “robustly demonstrate that children from households identifying as either of the two major world religions (Christianity and Islam) were less altruistic than children from non-religious households”. Basically, non-church kids were more willing to show generosity to their peers, as well as being more emotionally aware of their actions and the feelings of the other participants in the study. On the flip side, those from a religious background were quicker to judge their peers and want to see them punished for their behavior. The study didn’t look into the motivation behind the actions of these children, but rather simply stated their observations. The authors of the study did mention that while most of the world considers a faith in God as a prerequisite to moral behavior, this simply wasn’t the case in the children they studied. Based on that statistic I could say, of course there are people who demonstrate virtue that don’t have a relationship to a faith community. All people are created in God’s image; therefore, all kids have the capacity to love and demonstrate virtue such as generosity, compassion, forgiveness, etc. However, that is only a valid consideration only if the religious kids responded in the same way as the non-religious kids. According to the article, children connected to a local church, mosque, or synagogue—also created in God’s image—seem to demonstrate more anti-virtues like selfishness and judgment. One could argue human nature: Everyone sins and is need of redemption. Why is this the case? Why is this happening? Even if all kids are made in God’s image and have the potential to do good, those connected to a faith community should be even MORE generous and MORE loving and MORE accepting than their non-religious peers. But it’s the church-kids who show fewer of the virtuous behavior one would expect from a person who follows God. So, what is the church doing wrong? Because this sort of reputation is not ok. How can we teach Jesus and yet have kids walking away from our church environments no better, no more changed as a result of hearing and experiencing biblical truth? Are we having too much fun and not getting to the meat of the Word? Are we not teaching enough systematic theology? Are we teaching too much theology without a way for kids to practice faith? Are we teaching the Bible too much like a history or science book without relevance to life? Are we getting at the head-knowledge without consideration for the heart-knowledge that must also exist? Are we teaching at kids rather than talking with kids and engaging them in conversations about their faith? Is how we approach the Bible unknowingly compartmentalizing a child’s faith? Do they view their faith as something that is only practiced at church and not in their daily life? The Bible story isn’t over until the kids know what to do with it. I believe this with all of my heart. There is a response to the Bible. One has the choice to reject that response, but the Story of God, the message of Jesus, demands a response, a change of heart, and a change of practice. Sometimes the practice precedes the heart, and other times faith comes before practice. But the two must go hand-in hand. Faith without works is dead. And while, one could argue, well then works without faith is dead as well. And sure, yeah, it is… but just as faith can lead to changed behavior, as a child changes her behavior, she experience how that impacts her world and get a taste of the life God truly had in mind when He sent Jesus to live and die for humanity. We must teach kids that our relationship with God must translate into an EVERYDAY faith. As pastors, this is an area where we should continually cast vision—even to kids. Faith is not something that merely happens in the walls of the church. Our faith must be lived out loud in the way we work, play, talk, eat… live. We will be known by our love. We are a city on a hill pointing people to Jesus – what are we pointing to if we’re living opposite of Christ’s vision for the Kingdom of God? I truly believe that it is important for kids to know the stories of the Bible. BUT having head knowledge of the stories not enough. I want for all kids to understand that those stories can still impact their lives today in the way kids can follow the Greatest Commandments of Loving God and Loving Others. Like I said, this is where I am right now in my response to this research. You can read the whole Guardian article here. I’d love to hear your thoughts on this and start a conversation with leaders who want to see faith in Jesus come alive in the next generation. Let’s talk! Please comment below with questions and ideas.